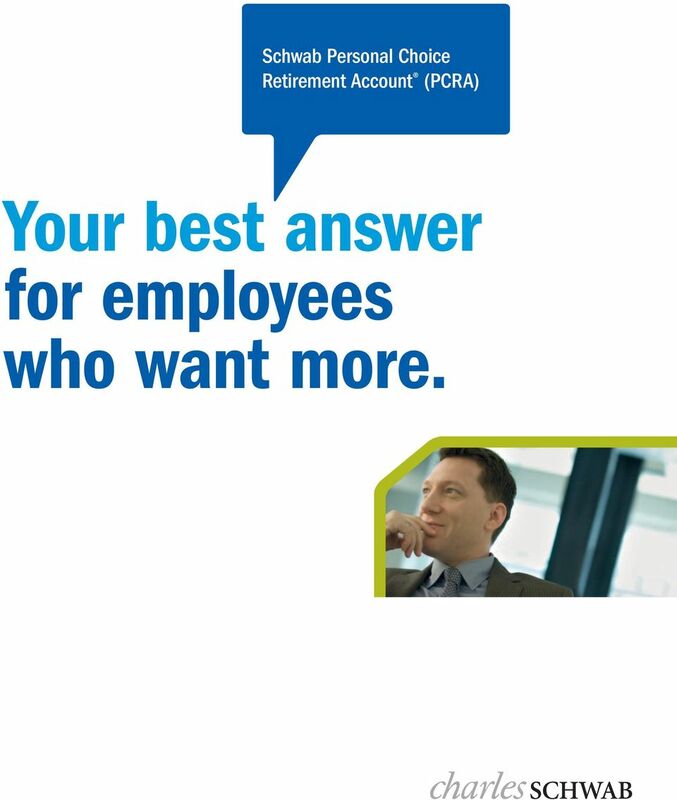 Download "Schwab Personal Choice Retirement Account (PCRA) Your best answer for employees who want more." 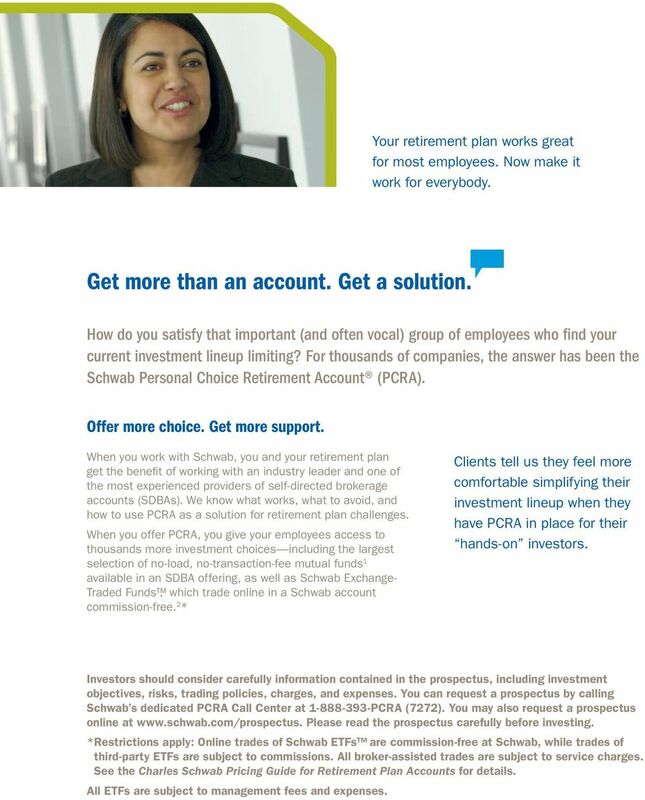 1 Schwab Personal Choice Retirement Account (PCRA) Your best answer for employees who want more. 2 Add the industry pioneer in self-directed brokerage accounts to your retirement plan. Schwab PCRA makes it easy. 3 Your retirement plan works great for most employees. Now make it work for everybody. Get more than an account. Get a solution. How do you satisfy that important (and often vocal) group of employees who find your current investment lineup limiting? For thousands of companies, the answer has been the Schwab Personal Choice Retirement Account (PCRA). Offer more choice. Get more support. When you work with Schwab, you and your retirement plan get the benefit of working with an industry leader and one of the most experienced providers of self-directed brokerage accounts (SDBAs). We know what works, what to avoid, and how to use PCRA as a solution for retirement plan challenges. 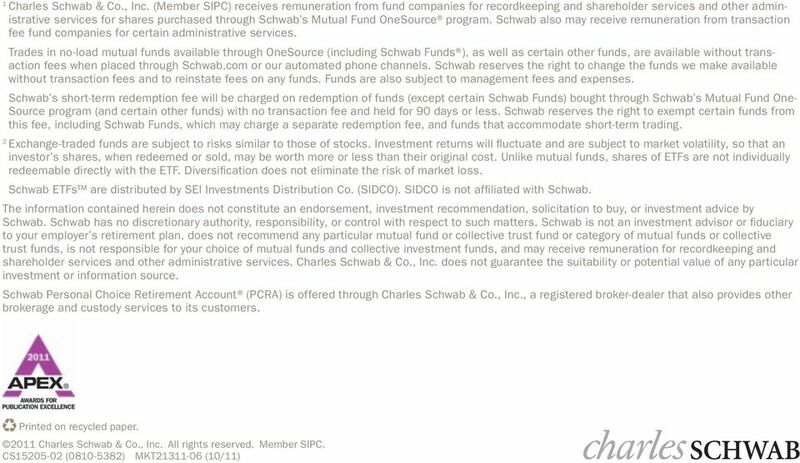 When you offer PCRA, you give your employees access to thousands more investment choices including the largest selection of no-load, no-transaction-fee mutual funds 1 available in an SDBA offering, as well as Schwab Exchange- Traded Funds, which trade online in a Schwab account commission-free. 2 * Clients tell us they feel more comfortable simplifying their investment lineup when they have PCRA in place for their hands-on investors. Investors should consider carefully information contained in the prospectus, including investment objectives, risks, trading policies, charges, and expenses. 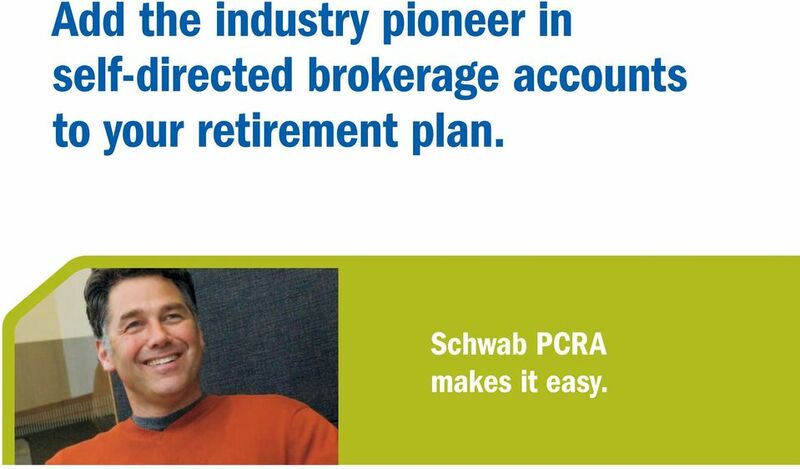 You can request a prospectus by calling Schwab s dedicated PCRA Call Center at PCRA (7272). You may also request a prospectus online at Please read the prospectus carefully before investing. * Restrictions apply: Online trades of Schwab ETFs are commission-free at Schwab, while trades of third-party ETFs are subject to commissions. All broker-assisted trades are subject to service charges. See the Charles Schwab Pricing Guide for Retirement Plan Accounts for details. All ETFs are subject to management fees and expenses. 4 Offer Schwab PCRA with ease. 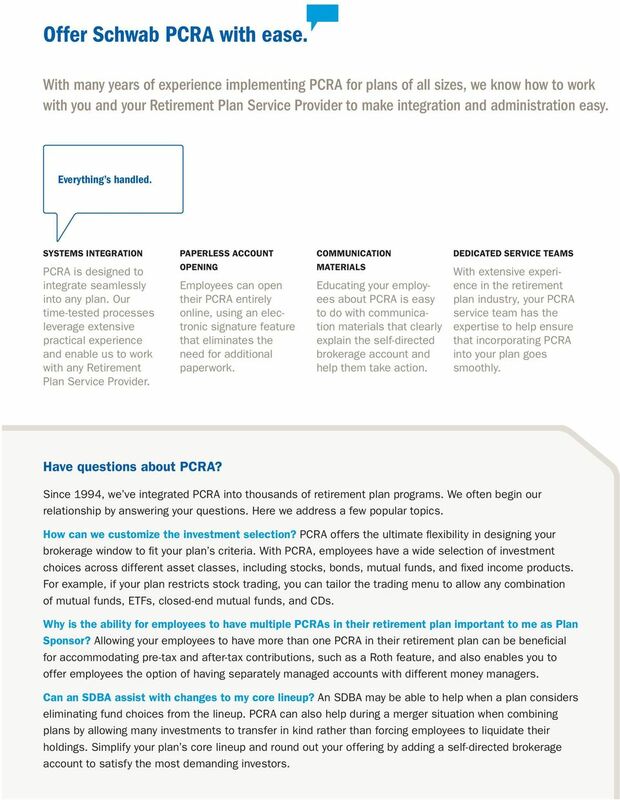 With many years of experience implementing PCRA for plans of all sizes, we know how to work with you and your Retirement Plan Service Provider to make integration and administration easy. Everything s handled. SYSTEMS INTEGRATION PCRA is designed to integrate seamlessly into any plan. Our time-tested processes leverage extensive practical experience and enable us to work with any Retirement Plan Service Provider. PAPERLESS ACCOUNT OPENING Employees can open their PCRA entirely online, using an electronic signature feature that eliminates the need for additional paperwork. COMMUNICATION MATERIALS Educating your employees about PCRA is easy to do with communication materials that clearly explain the self-directed brokerage account and help them take action. DEDICATED SERVICE TEAMS With extensive experience in the retirement plan industry, your PCRA service team has the expertise to help ensure that incorporating PCRA into your plan goes smoothly. Have questions about PCRA? Since 1994, we ve integrated PCRA into thousands of retirement plan programs. We often begin our relationship by answering your questions. Here we address a few popular topics. How can we customize the investment selection? PCRA offers the ultimate flexibility in designing your brokerage window to fit your plan s criteria. 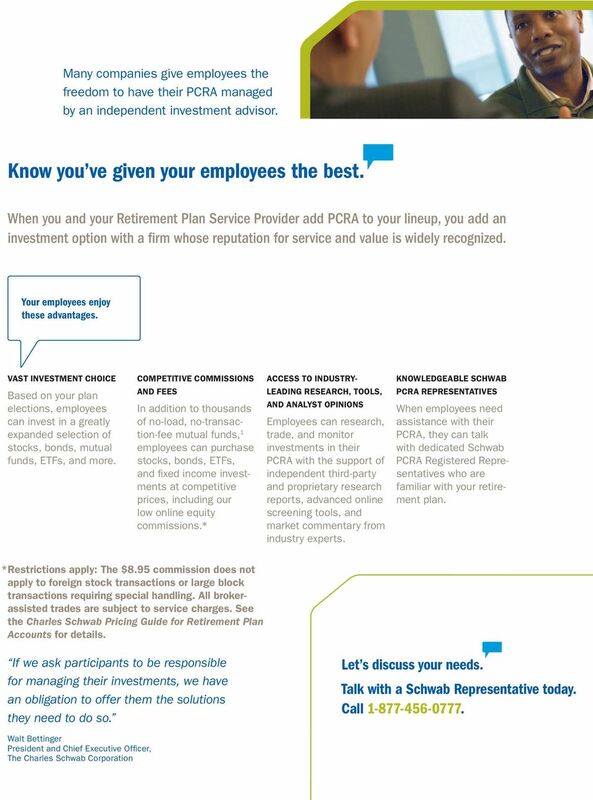 With PCRA, employees have a wide selection of investment choices across different asset classes, including stocks, bonds, mutual funds, and fixed income products. For example, if your plan restricts stock trading, you can tailor the trading menu to allow any combination of mutual funds, ETFs, closed-end mutual funds, and CDs. Why is the ability for employees to have multiple PCRAs in their retirement plan important to me as Plan Sponsor? Allowing your employees to have more than one PCRA in their retirement plan can be beneficial for accommodating pre-tax and after-tax contributions, such as a Roth feature, and also enables you to offer employees the option of having separately managed accounts with different money managers. Can an SDBA assist with changes to my core lineup? An SDBA may be able to help when a plan considers eliminating fund choices from the lineup. PCRA can also help during a merger situation when combining plans by allowing many investments to transfer in kind rather than forcing employees to liquidate their holdings. Simplify your plan s core lineup and round out your offering by adding a self-directed brokerage account to satisfy the most demanding investors. Managed Accounts: Expansive solutions for your clients. Greater opportunities for your business. Guaranteed income for life. In any market. 3(38) Fiduciary Services Complex challenges, simplified solutions Regulations are changing within the retirement plan marketplace and new fiduciary reporting requirements can be particularly challenging.